The “Magician from Riga”, Mikhail Tal is a Grandmaster and World Champion well known for his crazy, ridiculous attacks and sacrifices. Tal considered chess an art form and played as such, always playing for the initiative, even if that meant sacrificing material. Tal also is the record holder for most consecutive games without a loss, making two separate streaks of 86 and 95 games. The originator of the “Latvian School of Chess”, he had many students who became top players and helped his legacy to live on. Mikhail Tal learned to play chess from his father at the age of 8. After learning how to play chess, Tal went to visit Mikhail Botvinnik to play a game against him. This game never ended up happening though, but it shows Tal’s desire to compete with the best in the world at a very young age. In 1949 he began to learn from Alexander Koblents and improved his game very quickly. After winning a strong tournament in Zurich in 1959, Tal got the opportunity to finally play Botvinnik for the World Championship. In this match he won by a score of 6 wins, 2 losses and 13 draws, thus taking the title from Botvinnik and becoming the eighth world champion. Botvinnik was able to use his ability to rematch for the title the next year and ended up winning it back. Later in his chess career, from July 1972 - April 1973, Tal played 86 consecutive games without a loss and also had a similar streak from October 1973 - October 1974 when he played 95 consecutive games without a loss. These are the two longest unbeaten streaks in chess history. In a blitz tournament in 1992 he defeated Kasparov. 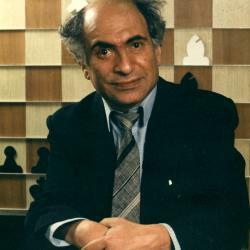 Mikhail Tal passed away one month later on June 28, 1992.